History is littered with many important moments, especially in the development and colonization of other countries. 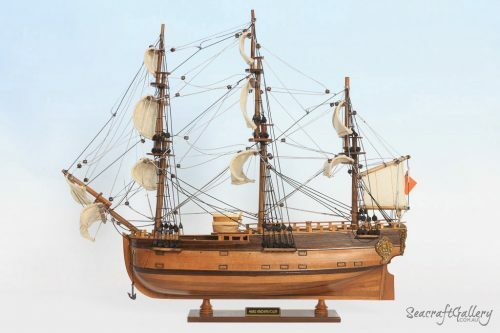 One such example of this is the HMS Sirius, the flagships of the First Fleet ships. It set out from England in 1787, via Portsmouth, to help set up a European colony in New South Wales, Australia. 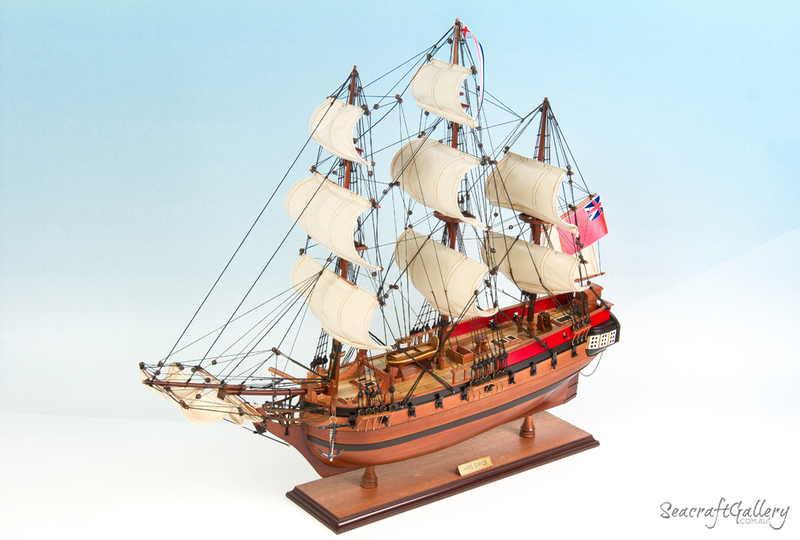 The HMS Sirius played a major role in the discovery and establishment of Australia. 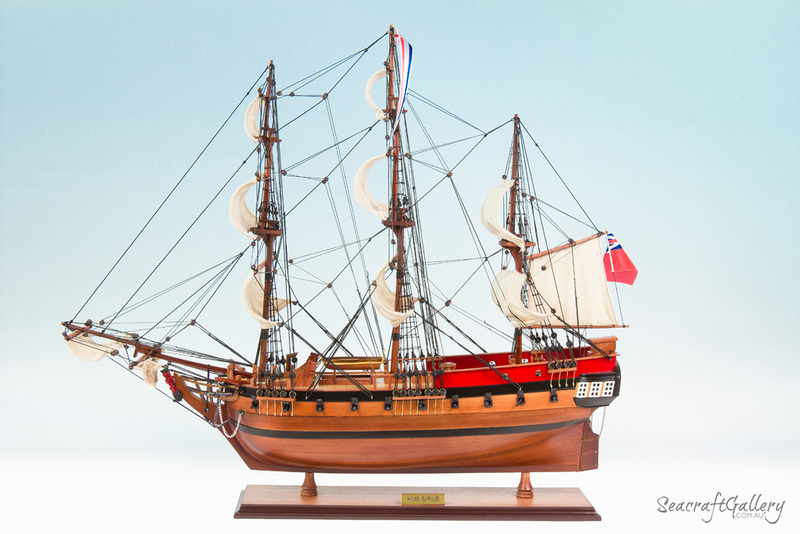 With HMS Supply, the HMS Sirius was among the most important ships of this journey. The HMS Sirius, then, has become a popular choice of ship thanks to its legacy. Many of its artifacts found post-wreckage, too, can be found in the Australian National Maritime Museum, Sydney. 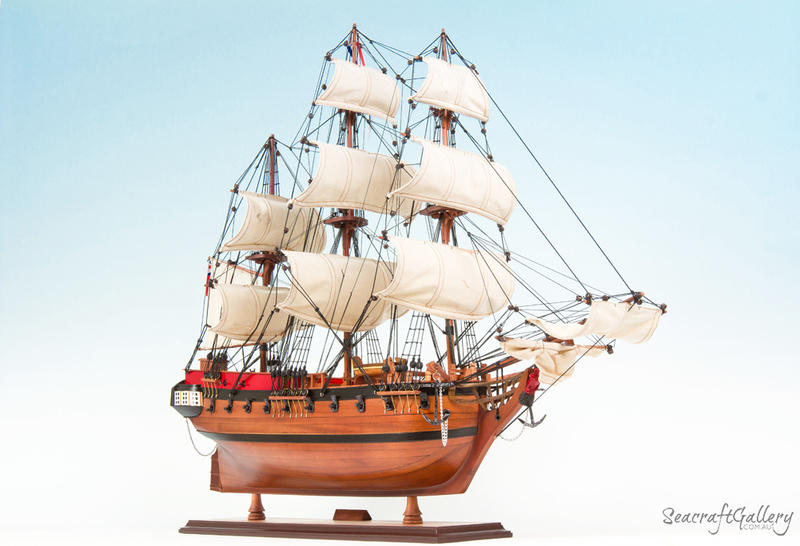 As one of our most popular ship models, this is one that has become very popular for putting up on display. You can also easily showcase this model in a display cabinet. Thinking of doing so? Then you can easily do so using our hardwood display cabinets. The model is fully assembled and ready to display. It’s not a kit. 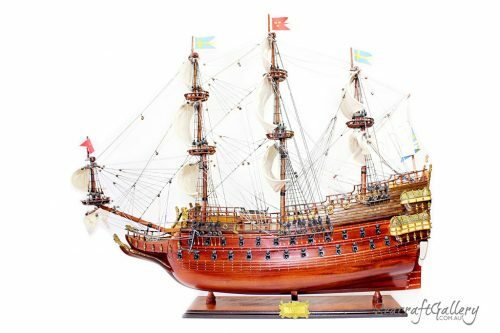 75 x 19 x 68cm in size, at a 1:45 scale of the real ship (also available in 45cm size). 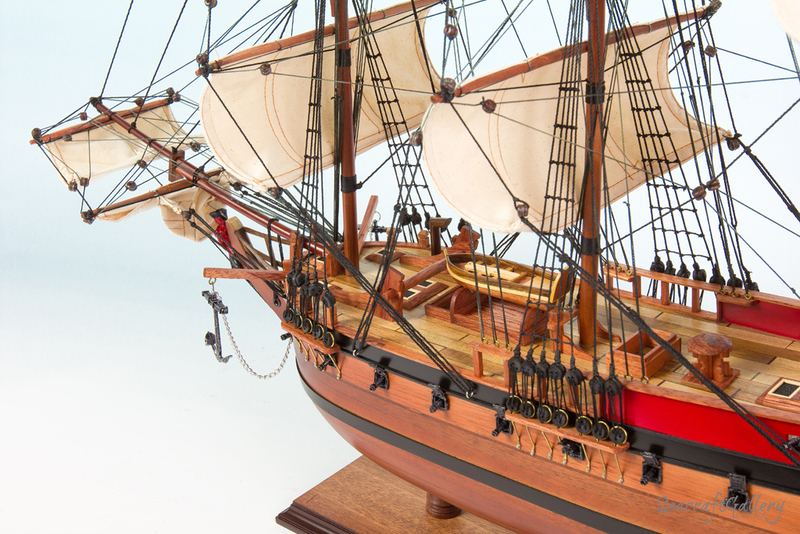 Built to scale, using real plans and imagery of the ship for the best finish. 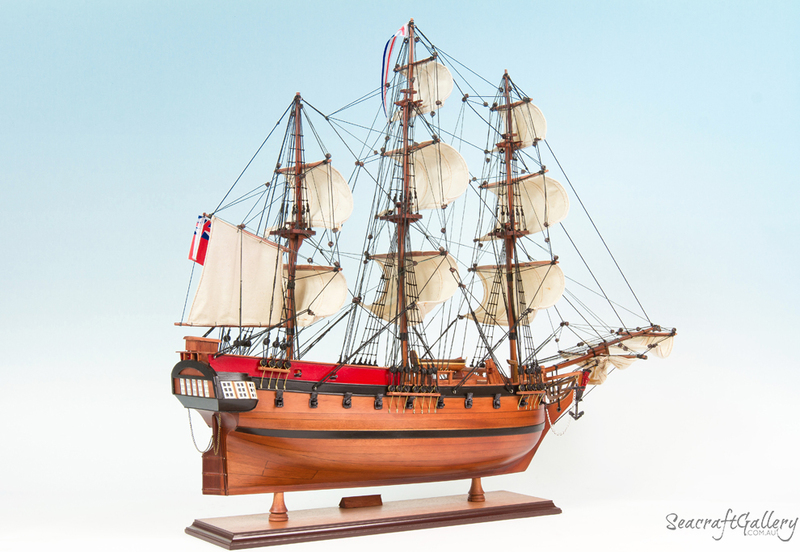 Made hand-built with everything created using individual model wooden planks. High quality wood that is used to help make sure that it can handle changes in temperature. 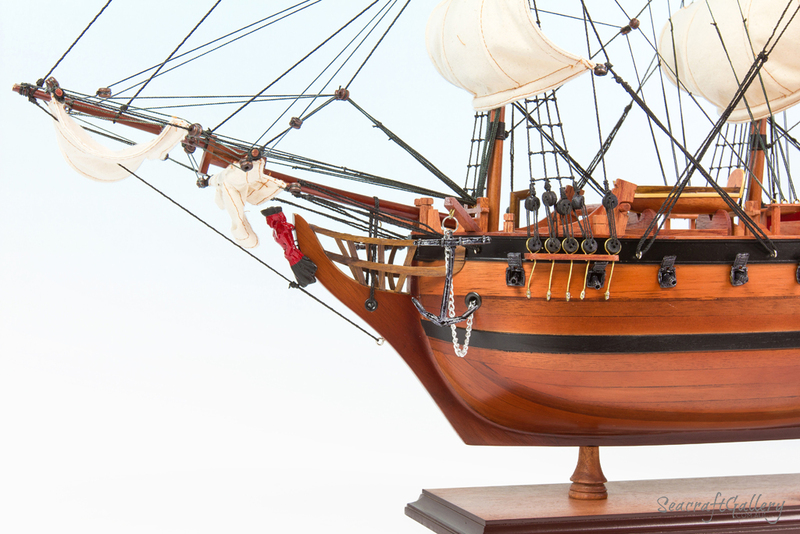 All of the major features, like cannons and anchors, are made directly using sculpted metals. 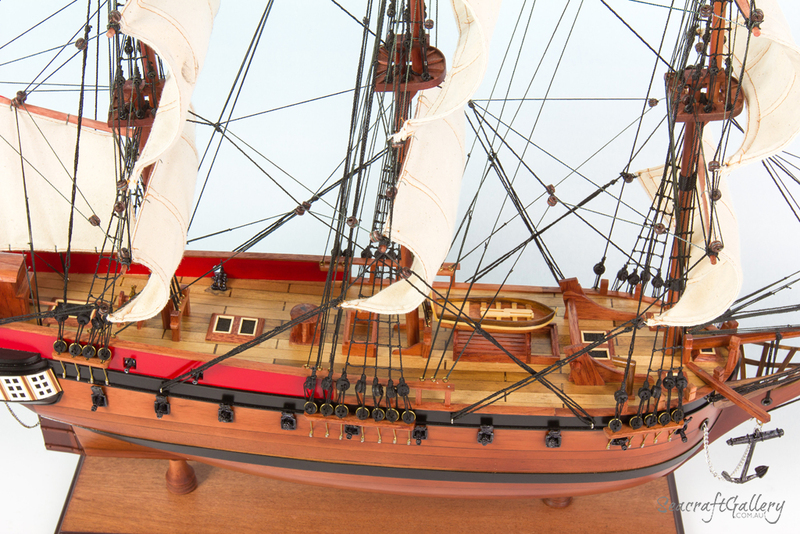 Gun ports are included, with the gun ports sliced into the hull for the best effect. Other major features are included, such as lattice grates, rudder chains, lifeboat, steering wheel etc. Handmade sails included, with a series of fine linen prepared for the best finish. 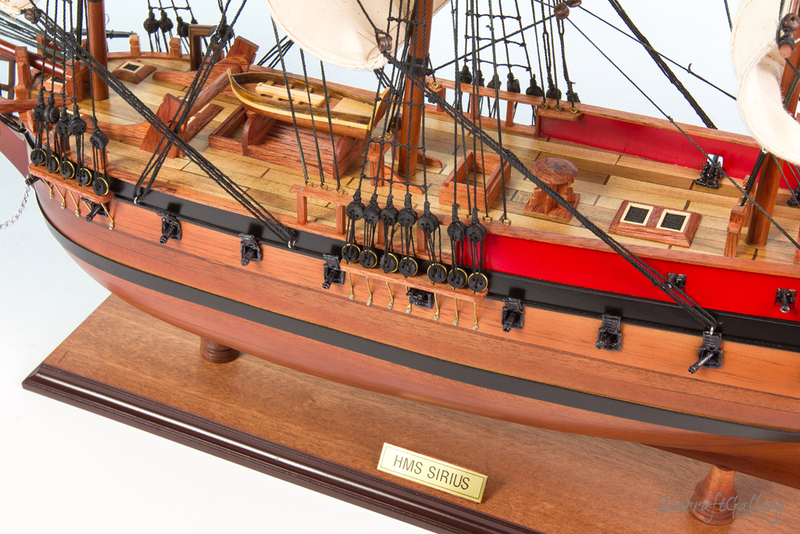 An HMS Sirius model ship that is designed with a wooden base and nameplate included. Fact sheet added in for making it easy to show others all about the HMS Sirius. Many ships are built with a specific purpose. The HMS Sirius, though, was built with one of the most important objectives of its era: discovery. It did not start out life as the Sirius, though: indeed, it was once known as the HMS Berwick, keeping that name from 1781-1786. In the same year, though, it was relaunched with the main aim of working as part of the Royal Navy. Eventually, though, an even greater purpose was found for the HMS Sirius. 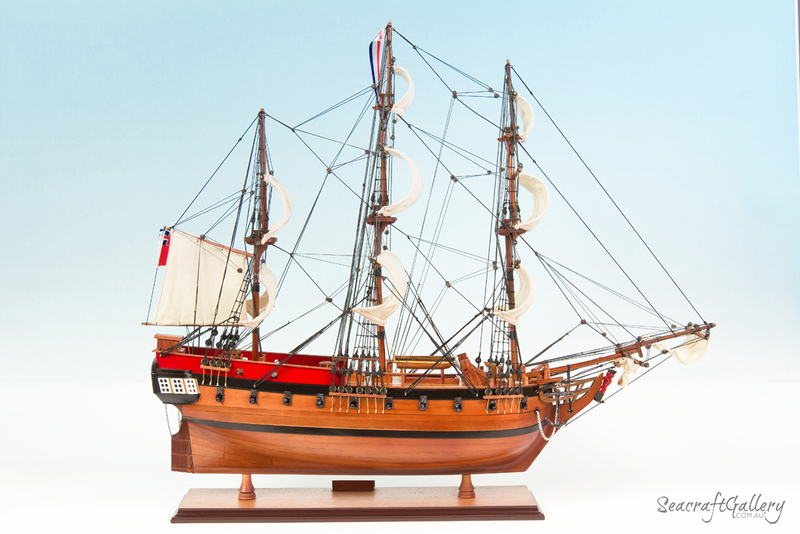 The HMS Sirius played a major role in the discovery and establishment of Australia. It was part of the First Fleet which played such a key role in the establishment of a colony across Australia. The HMS Sirius (and HMS Supply) were among the most important of this journey. With around 160 men on-board, the ship was under the command of Arthur Philip and John Hunter. Once the colony was set up, Hunter was to take official charge. Eventually, after stops at the likes of Santa Cruz ad Rio de Janeiro, reached New South Wales in May 1787. The first port was set up at Sydney Cove, within Port Jackson, in 1788. This became known as ‘Australia Day’ and became a key settlement for the region. 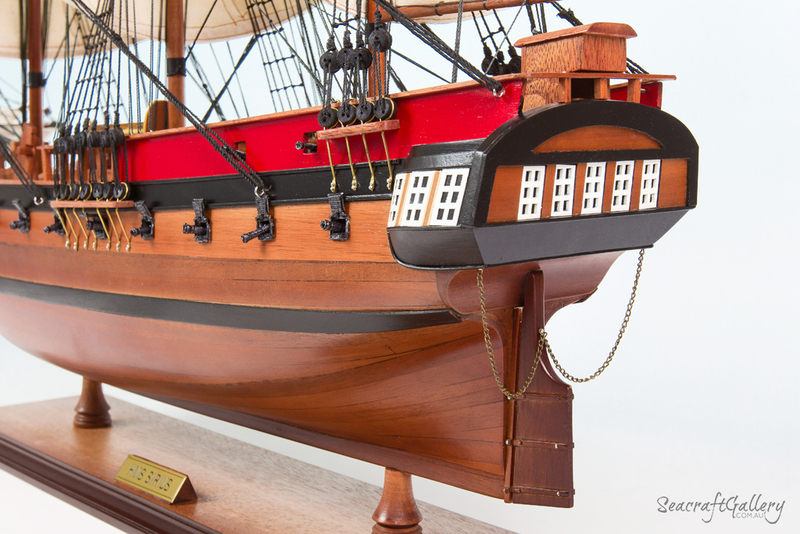 The HMS Sirius, though, was used for numerous food and supply runs, and managed to sail around the whole world – including a trip to Norfolk Island in 1790 to drop off some soldiers and supplies. However, poor weather meant getting the supplies onshore was going to be impossible. Sadly, Captain Hunter pushed the boat too far when trying to land the supplies on Sydney Bay. The ship was damaged, wrecked on a reef on March 19th, but nobody was lost in the wreckage. What was lost, though, was a legend of the industry: the HMS Sirius. 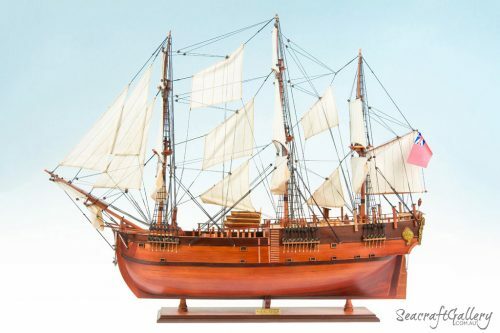 Today, though, it’s still remembered as one of the major ships used in the settlement of Australia for Europeans. Great seller! Item arrived Undamaged and was packed so nothing could happen.